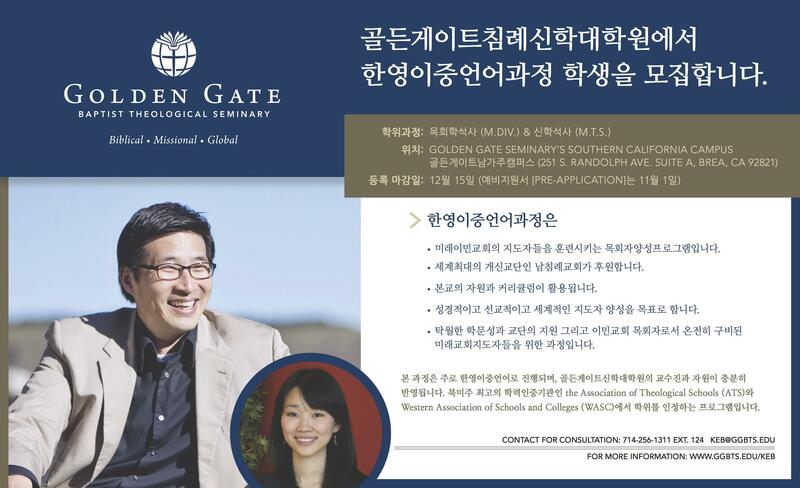 Women of Golden Gate – This full color ad was created for a printed program booklet for a women’s event taking place during the Southern Baptist Convention’s annual meeting. We used this same ad for four years, to build recognition. Because it was a smaller 5.5” x 8.5” booklet, the quarter-page ad needed to be simple and convey only the most important information: diversity, contact info, logo, and the tagline. Seminary Day – This 5.5” x 8.5” black and white printed card was used as a handout in church bulletins at churches in the seminary’s geographical area (Western U.S.). 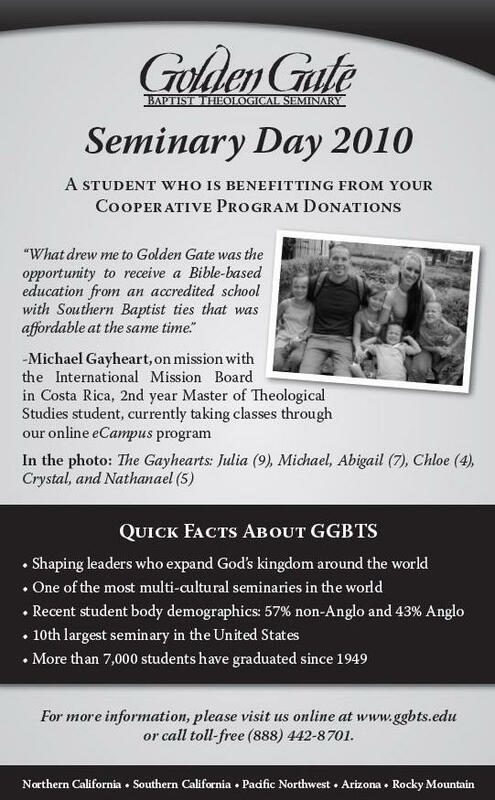 The handout accompanied a representative who described Golden Gate Seminary’s program. The purpose was to inform donors about how their funds were being spent and to encourage additional donations. 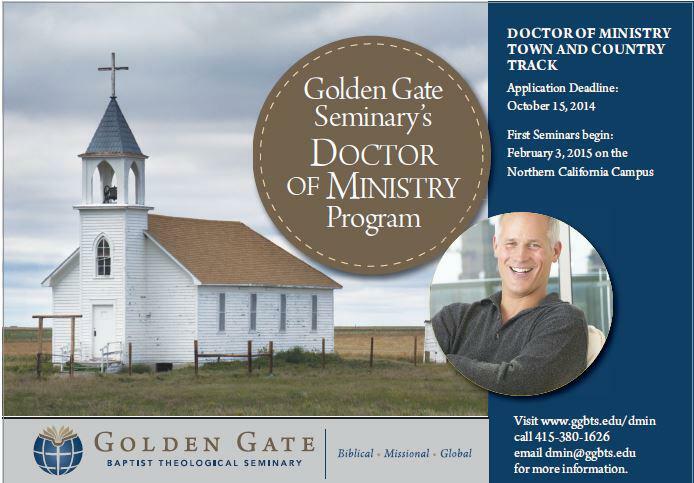 Doctor of Ministry Program Town & Country Track – This full-color advertisement was created for newspapers to promote a new program for pastors living in more rural settings (not urban cities). The ad, created in a variety of sizes, was placed in both print and online newspapers. Youth Pastors – This full color ad was created for Portraits, a print magazine distributed in Arizona. The purpose was to encourage Youth Pastors and others to acquire a seminary education. 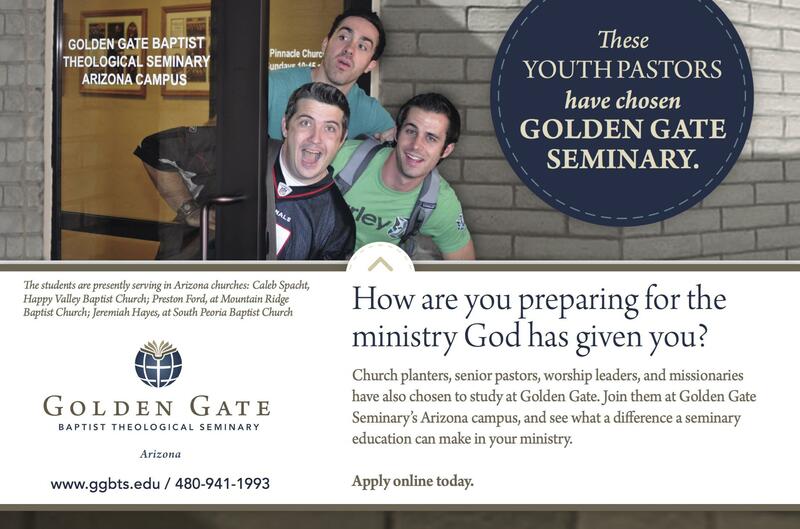 We used real students who were currently youth pastors, and shot the photo at the Arizona campus. Because of the close-knit church community, we included the names and churches of the students in the ad. Doctor of Ministry Hawaii Track – This black and white ad was created for a print newspaper with a readership based in the Hawaiian Islands. 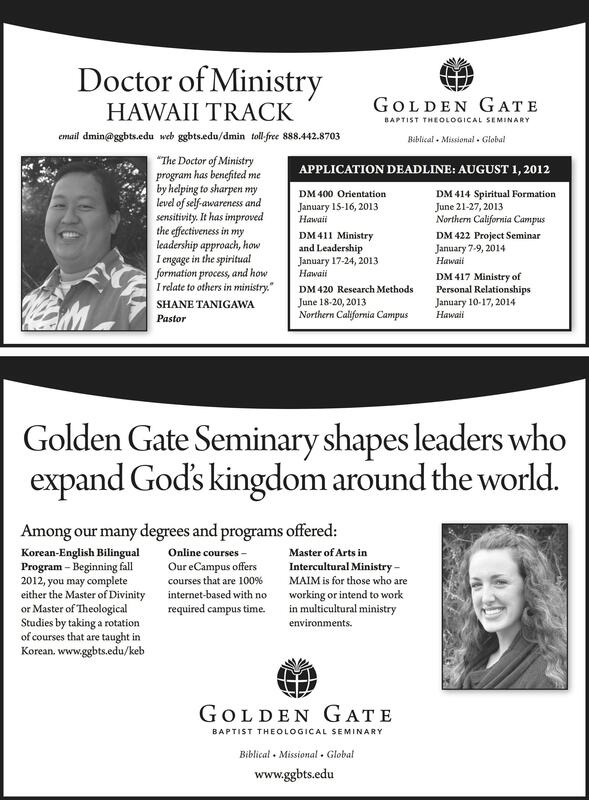 Golden Gate Seminary Shapes Leaders – This black and white ad was created for a print newspaper with a readership based in the Hawaiian Islands. The ad space was purchased by two different departments, who shared the expense. We designed this as two separate ads. Korean-English Bilingual Program – This full-color ad was produced by contracting with a Korean-English graphic designer. The ad was printed in several Korean newspapers, and also digitally as an online pop-up ad. Biblical. Missional. Global. 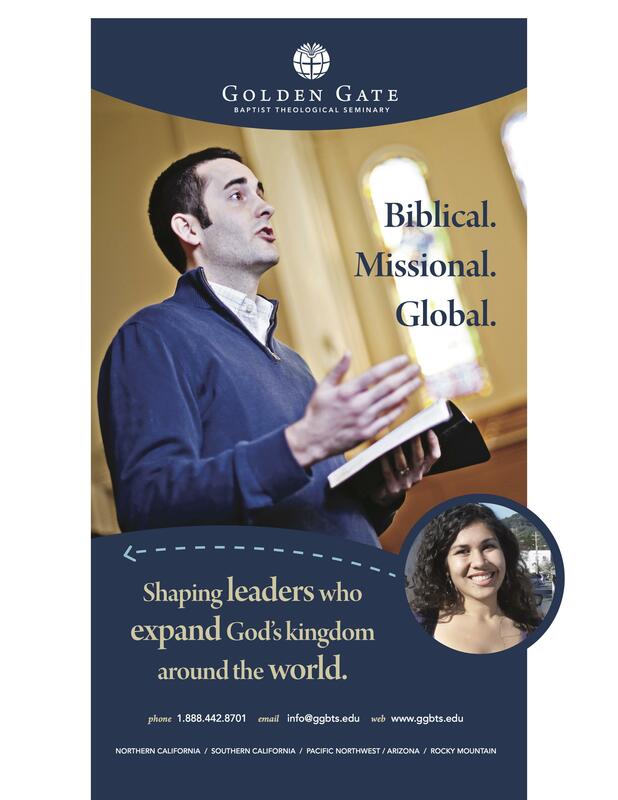 – This full-color full page ad was created for Golden Gate Seminary as part of their rebranding campaign. This ad was used repeatedly to market the seminary to prospective students. It was printed in college newspapers, Christian publications, and event program booklets. It incorporated the tagline, the mission statement, listed all five locations, and showed both men and women, as well as diversity.